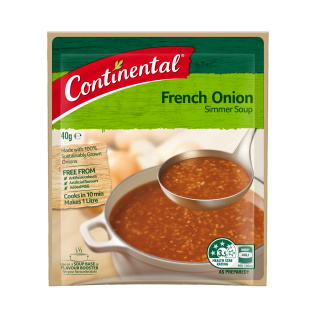 Try Continental French Onion Simmer Soup for a tasty snack and meal, or try one of our great recipes with it, like our BBQ Thai Beef Salad or American Burgers! Onion^ (40%) (pieces, powder), starch (potato, corn), salt, sugar, yeast extract, mineral salt (potassium chloride), natural flavour, food acid (sodium citrate), maltodextrin, burnt sugar, sunflower oil, flavour enhancer (635), natural colour (turmeric), parsley, spice extract. Stove Top: 1) Empty soup mix into a saucepan with 4 cups (1 litre) of cold water and mix well. 2) Stir until boiling and simmer for 5 minutes, stirring occasionally. This appears to be gluten free, bUt i’d love ConfiRmation! Hi Liz, unfortunately no products from our Continental range are suitable for those following a coeliac diet. Even if they are not comprised of ingredients containing gluten, we cannot guarantee that cross-contamination has not taken place.